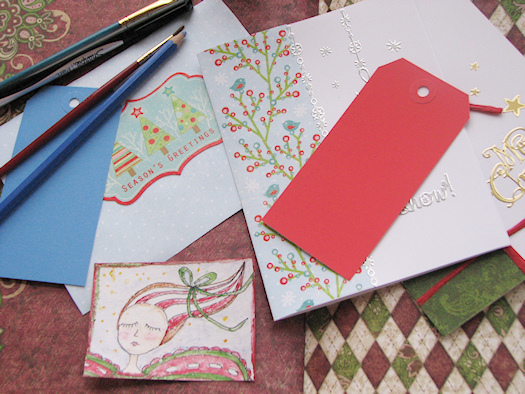 It’s been a frosty week here, perfect for staying inside, making cards, writing cards and painting. If you know me and think you will be getting a card in the mail from me, you may want to stop reading now and mark this post to read later… or you could peek. Glue and paints and pencils, papers, stickers and pens have spread themselves out over my craft table and haven’t been put away for days. Does your work space look like this too? Did you spy the little fairy? I was doodling and she magically appeared. 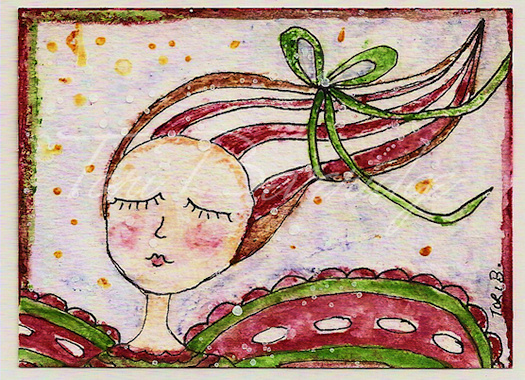 She’s ACEO sized (2.5 x 3.5″) done in ink, watercolor pencil and acrylic on Mixed Media paper. I like the candy cane stripes in her hair and the barely visible, little dots of snow that I splattered on a whim. I made prints of her and glued them to card stock. I printed with a fine Sharpie around the image, as nicely as possible (calligraphy is not my strong point). It ended up looking pretty cute. 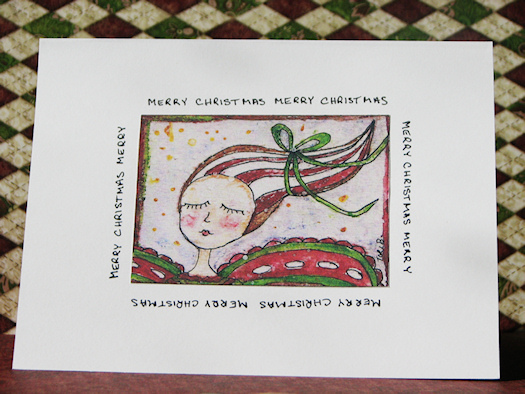 All the fairies made their way into envelopes and are on their way to spread their message of Merry Christmas. 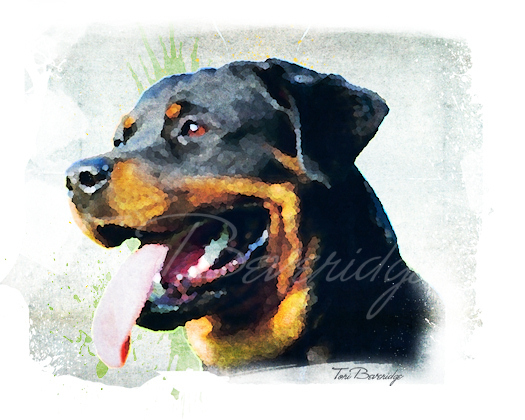 When I wasn’t sitting at the craft table, I was here in front of the computer screen, working on my dog paintings. I’ve managed to finish three more. You’re seeing them here first. I haven’t had the chance to put them up in my gallery yet. I’ll find the time tonight to do that. 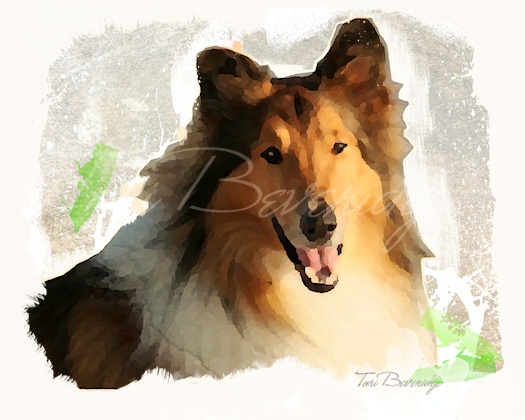 This post is linking up with Creative Every Day’s December Challenge. 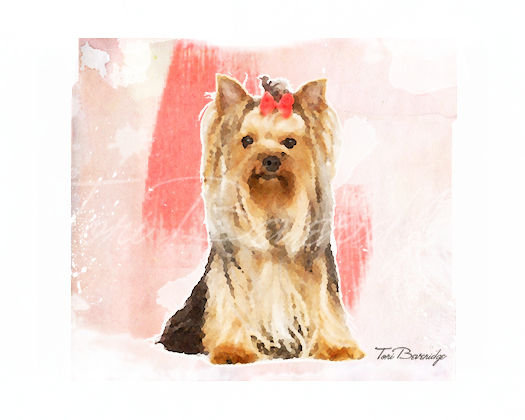 Posted in Tori Beveridge and tagged ACEO, art, artist, card making, collie, dog, dog art, dog painting, doodle, rottweiler, Tori B, yorkie, yorkshire terrier. I know you can, I know you can, I know you can…. your little fairy is so darned cute! Love her!! I hopped over from Creative Every Day. Your work is inspiring me today!